Net Generation aren’t more tech savvy than their teachers just because they were born into a world full of computers. In fact, if it weren’t for the coaxing and support of their educators, many students would never use their electronic devices for more than playing games or listening to music. Wang and her team investigated the technology skills of 24 science teachers and 1,078 middle school students from 18 different schools in two US states. The students surveyed are considered third-generation digital natives, for whom technology access and ownership has become the norm. Both teachers and students were found to have rich outside-of-school technology experience, but students were not tech-savvy in the classroom. Most were not very familiar with information and communication technology or even Web 2.0 tools designed to make information production and sharing easier. Their teachers, on the other hand, depended much more on using technology to solve daily problems, to improve productivity, and as learning aids. As much as anything else this study demonstrates just how vital it is that teachers are provided with high-quality training on how they can integrate content-specific technology into their curricula – and how to teach their students how to use technology more effectively in the process. You simply cannot assume that because students are ‘digital natives’ they know how to make effective use of technology in a productive fashion. School-age students may be fluent in using entertainment or communication technologies, but they need guidance to learn how to use these technologies to solve sophisticated thinking problems. The school setting is the only institution that might create the needs to shape and facilitate students’ technology experience. 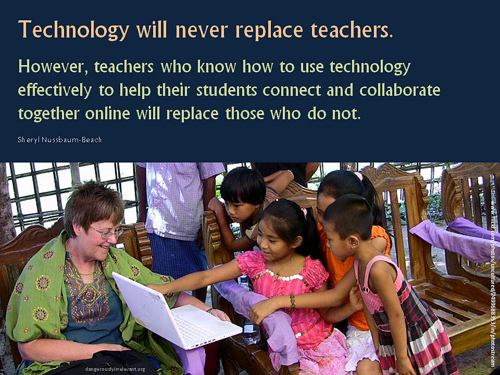 Once teachers introduce students to a new technology to support learning, they quickly learn how to use it. Whether we are talking about teaching students coding or more generally about making use of technology the key pivot-point is the teachers. While it’s tough for some teachers to model use of technologies they still find bewildering and threatening, they must step up and provide leadership lest we create a generation that can be compared less to the concept of the noble native living at one with their environment and more to a cargo-cult.